Types of Banners. We can display three types of graphics ads: banners, buttons and vertical banners. 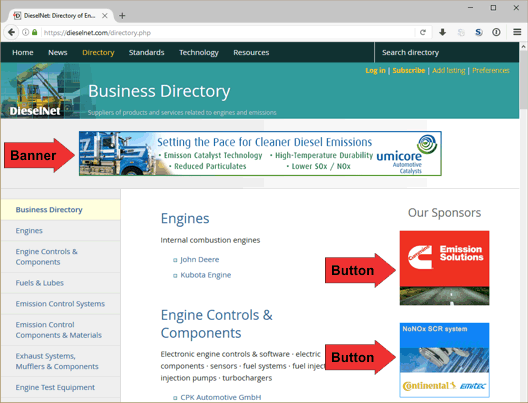 Banners and buttons—linked to your web site or the your DieselNet Business page—are displayed in various DieselNet pages on a random rotation basis. The exact sizes and formats are given in the technical specifications page. Banners are horizontal rectangular ads displayed at the top part of several pages, just underneath the page header. In some pages, the banners are also repeated at the bottom part of the page. Buttons are graphic ads placed in the right margin area in many DieselNet pages. An example page with a banner and two button ads is shown in the following screenshot. Vertical banners are vertical rectangular graphic ads placed, together with buttons, in the right margin area, under the heading “Our Sponsors”. Frequency of Display. We guarantee a certain minimum frequency of display for your banner and/or button, which depends on your sponsorship level. This frequency—expressed as a number of impressions per month—will be specified in the advertising plan proposal we prepare for you. We typically display your banner/button in more than one DieselNet page. 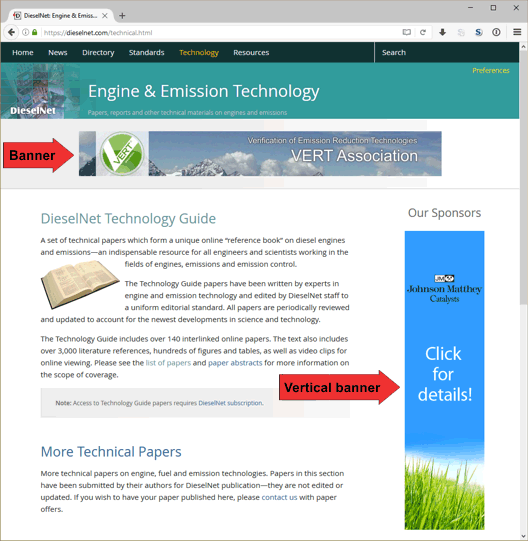 Some sponsors wish to have their banners displayed in the home DieselNet page. Regrettably, we are not always able to accommodate such requests. We can usually give you some presence in the home page, but the relative frequency of your banner may be relatively small (please note that our home page receives about one thousand requests per day). Click-Throughs. The click-through rate on DieselNet is typically around 1% - 2% (i.e., if your banner is displayed at 5000 impressions per moth, you can expect it to be clicked on by our visitors about 50 - 100 times per month). Click-through rates can vary depending on the product, company, as well as the banner design. We have also noticed that, strangely enough, banners for better known more established brands receive more clicks than those for less known products.